1. Upload images button available when composing post (in forum). When you "compose" your post you now have the option of uploading an image (or multiple images) and having the bbcode links automatically embedded into your post. 1. Simply compose your post up to the point where you want your image(s) to appear. 2. 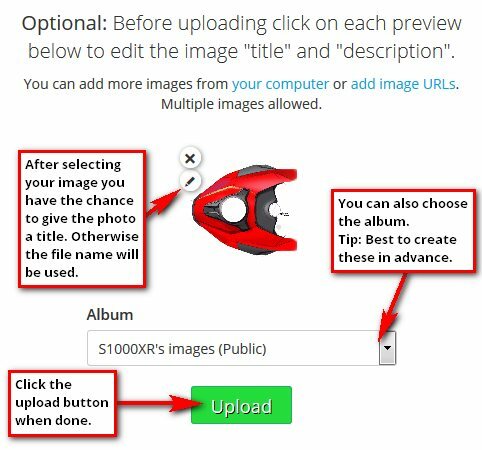 Then hit the "Upload images" button and you'll be taken to the Gallery where you can upload your image(s). 3. You'll be prompted for your Gallery username/password if not already logged in. 4. Once the image(s) have uploaded you'll be instantly retuned to your post and the links will be "auto magically" inserted. This button is in addition to any existing functionality so you can still upload in the Gallery normally if you wish. Please note that this is now the preferred way of adding images to your posts. In future "Attachments" will be confined to non-image files like documents, data files, etc. This will slowly be introduced once people have got used to using the Gallery for their images. Eventually the use of attachments for adding images will be withdrawn. The Photo Gallery now has a new viewer. Simply click on any image preview and the viewer will launch. You'll then be able to scroll left and right etc to view other images in that area. To obtain the bbcode of an image in the viewer simply click on the image and the code will be below if you scroll down. The Photos Gallery can now accept 4K / UHD images up to 3840x2160 resolution. The Photos Gallery has also had several "bug" fixes. Create Albums for your Images ! We highly recommend that you create albums for your images. If not, then your images merely sit in what is essentially a big bucket assigned to your profile. Keeping you images in albums gives you some extra functionality and makes then easier to track as they build up in numbers. The Photos Gallery is now the recommended method of adding images in your posts. Don't forget, it's not just a gallery, it's a image hosting facility as well. Also, the upload limit is far greater in the Gallery at 5MB per image. Unlike attachments, images are served by worldwide edge servers, making it quick and efficient. Feel free to post any questions/queries here.